The National Highway Traffic Safety Administration (NHTSA) reported that overall traffic fatalities at the end of 2009 reached the lowest level since 1954, declining for the 15th consecutive quarter. The projected data puts the highway death count at 33,963, down 8.9% from 37,261 in 2008. That’s good news but, one death is too many. Today I would like to discuss getting to your RV travel destination safely. Getting there can be half the fun, as the saying goes, if you take a few precautions to make your trip as safe as possible. Trip Planning: The first step is to plan the trip you are taking. Travel guides, magazines, state tourism boards and Internet sites offer valuable information to help you plan your trip. Route your trip on a map or from an Internet trip planning website. Always keep an atlas or maps in the RV or tow vehicle. Driving a motorhome or pulling a trailer can be stressful, especially if you don’t know the route you will be traveling. Using a GPS system can make traveling much less stressful. I am including this short checklist to assist you in planning your RV trips. ■ Route your trip on a map or from an Internet trip planning website. ■ Plan your itinerary to include what campgrounds you will be staying at. ■ Give a family member or friend a copy of your itinerary and contact information. ■ Make campground reservations in advance especially during the busy travel season. ■ Limit your traveling to 350 miles a day or less. Not only will your trip be more enjoyable, but this will allow plenty of time to get set-up at the campground before it gets dark outside. ■ Make sure your emergency roadside service is up to date. If you don’t have one you should get one prior to leaving on your trip. ■ Conduct pre-trip checks for your RV. ■ Check and refill any medications you will need. ■ Be sure you have your credit cards, ATM card, checkbook and cell phone. ■ Check the weather conditions for where you will be traveling each day. Take a weather radio receiver with you. Don’t travel in bad weather or during high winds. ■ Take your address book and stamps. ■ Take emergency contact numbers. ■ Take a spare set of eyeglasses or reading glasses. ■ Take a spare set of keys. ■ Make sure you have all your owner’s manuals for the RV & warranty information. ■ If you’re under a doctor’s care take along a copy of your medical records. Make a list of all medications you are taking and keep it in your wallet or other safe place for quick reference. ■ Take passports (only if necessary) and check the expiration dates. ■ Double check that everything is loaded in the RV. Pre-Trip Checks: Do you know what two of the most common repairs made on RV’s are? They are repairs to the steps and the TV antenna. Damage to RV steps and TV antennas occur frequently and can be costly to repair. The main reason for these frequent repairs is because you forget to do a walk around of the unit before leaving on a trip or leaving the campground. The good news is both of these common repairs can be avoided by following a simple “Pre-Trip Checklist” before heading out in your RV. Simple checks like checking your tires, lights, hitch work and other items all contribute to a safer, stress free trip. You should make these checks everyday before traveling. RV Travel Security: For one minute, try to think the way a criminal would think. If you were at a rest stop looking for your next target or victim, what would you look for? Let’s pretend for a moment that you were going to target a vehicle. Which would be more appealing, a car whose owner stopped for a quick bathroom break or an expensive looking Type A motorhome, whose owners are out walking their dogs? I don’t have the mind of a criminal but this is an easy choice. That expensive looking RV probably has expensive contents inside like, jewelry, cameras, or a laptop computer. Okay, we have come to the conclusion that we, the RVers, are the prime target for the criminal mind, so we need to understand what we can do to protect ourselves and our personal belongings when traveling in our RV. Don’t stay overnight at a rest stop. Rest stops attract criminals. If you stop at a rest stop it should only be for a short break and then back on the road. 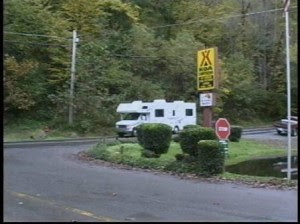 Lock the RV and take turns using the facilities, always leaving someone in or close to the RV. Always be on the look out for anything or anyone that looks suspicious. Keep your cell phone handy in case you need it and don’t ever open the door for anybody unless you know who is knocking. Rest stops aren’t the only place you need to be concerned about. Every time you stop to refuel there are certain precautions you need to take. It’s easy to be vulnerable to a thief at a gas station or a truck stop. I have a bad habit of leaving my wallet on the console of our motorhome. The door isn’t locked and your spouse is taking advantage of the time to walk the dogs. This is how quick it can happen. Get in the habit of locking the doors whenever you or someone else is not physically in the RV. Most robberies occur at night and most travel related robberie occur at rest stops, gas stations, convenience stores and ATM machines. Try to schedule most of your stops during daylight hours, and whenever you stop be aware of your surroundings. If something doesn’t look right leave. As much as we would like to believe that campgrounds are 100% safe and secure don’t let you guard down. You don’t need to be paranoid, just use some common sense. Don’t leave expensive equipment lying around unsecured. Vehicle tow bars, hitches, bicycles and other items need to be under lock and key. Keep any valuables inside the RV secured and out of sight. It’s a good idea to purchase a small fire proof safe to store valuables and important paperwork in. The safe might protect your valuables from the hazards of a fire but it will still need to be stored in a secure, out of the way place, inside the RV. Always lock the RV when you’re not physically at the campsite. Do not store valuable equipment in outside storage compartments. Believe it or not, a vast majority of RV’s use the same exact key as yours for outside storage compartments. If you store valuables, like golf clubs, fishing gear or tools in the outside compartments you may want to have the storage compartment locks changed. Before you leave on a trip make sure your Emergency Roadside Service Plan is current. If you breakdown on the road try to pull off in as safe a place as possible and call for help immediately. Stay with the RV until help arrives. It’s unfortunate that we live in a day and age where we need to take these added measures to protect ourselves. I don’t want you to feel like everybody you meet during your travels is a thief or has bad intentions. Just use common sense and be aware of what is going on around you. On the Road: NHTSA reports ninety-five percent of crashes are caused by human error. ■ Drive at a safe speed for the traffic and road conditions. ■ Always stay alert, know what is going on around you. ■ Anticipate driving situations before they happen. Avoid driving or pulling your RV during bad weather and high winds. Because of the size and mass of RV’s it can be extremely dangerous to travel during periods of high winds. It’s better to get to your destination one day later, than to risk traveling in bad weather. Always leave plenty of room between you and the vehicle in front of you. RV’s are much heavier than your automobile and require a longer braking distance to come to a stop. This alone will prevent accidents, especially during emergency braking. Driving at a safe speed also lowers your braking distance. Always use a supplemental braking system on the vehicle you are towing. Goodyear offers a free Recreational Vehicle Tire and Care Guide. It has some great suggestions for all those miles of carefree driving.